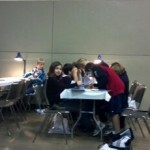 Bel Mar Coin Club encourages and welcomes Junior members to attend Club meetings and Coin Shows. 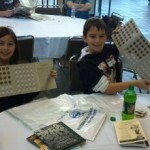 These photos are of 1 of our Junior members and a friend attending the Whitman Coin Show in Baltimore. 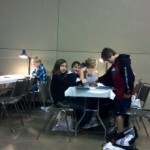 Whitman does a fine job with their “Kids Korner” each time they host a Coin Show at the Convention Center. If you are a parent interested in Coin Collecting, please visit the next Bel Mar Coin Club monthly meeting or bi-annual Coin Show, and bring your kids! See the About Us Page for contact information. Hello- My son Ian has great interest in coin collecting. He already had some nice coins in his collection. He just inherited some new coins and he is curious to learn more about them. Is there any one we could meet and bring these coins to learn their history? You can only get so much off the internet-he has tried!